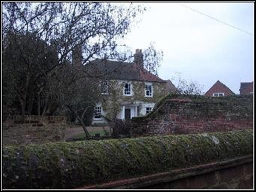 A survey carried out in 1623 referred to the vicarage house being in an acre orchard and garden bounded by the lands of George Dunston a churchwarden in 1635 to the north, on the east by the common highway leading to the river in the south and the river to the west. On the other side of the common highway was a small house with the churchyard to the north, the land of Robert Garret to the east and the river to the south. A Robert Garrett, clarke appears in the church rate assessments from 1673 to 1684. The rate of 24th February 1681 made specific reference to the repair of the fence wall between the lands of Mr Robert Garrett and the churchyard and the churchwarden’s accounts make reference to £15.15s 0d pd to Henry Boylett for bricks, lyme, sand and all workmanship for building three parts of the wall at the east end of the churchyard (the other part to be paid by Mr Robert Garrett, clerke by agreement made between the parishioners and him). It is interesting to note that the churchwardens mention that Mr Garrett had not, in his capacity as a parishioner, paid his proportion of the parishioners’ contribution, 8d! There are assessments in respect of the Parsonage for Lord Aungier (1673-6) with tenant and Richard Bird and William Harvest as tenants (1682-5). There seems no doubt that the house was not used as the vicarage in the 19th century or even in later years. Possibly it was too small for the large families common to Victorian clergymen. The censuses of 1851-81 show the use of the house for the accommodation of curates. What is now The Grange became the Vicarage (or2 Parsonage) in the early 19th century. John Bowman curate of Woking and his wife Mary together with Thomas White groom and Eliza Chitty house servant. Francis White, curate of Woking, his mother Eliza White and two house servants, Harriett Hill and Elizabeth Penning. Carter William Daking Ireland Moore Member of the Cambridge senate, MA of St John College, Cambridge, clergyman, curate of Woking, Hon. Chaplain to the Royal Dramatic College, Woking and domestic chaplain to Viscount Valentia. In a diary entry of 8th August 1869, Edward Ryde notes, Mr Carter Moore, the new curate. With this distinguished gentleman lived his wife Lucy Fanny and their children, Annesley Valentia Daking Ireland, Mary Windham Mountmorris, Haversham Anglesey Carter William, Drogheda Wentworth Mountcathel and Lucy Beaufort Noel Sarah Somerset plus an annuitant visitor, Georgiana Elizabeth Nurse and a general servant, Ann Edes. Admitted sizar (subsidised student of moderate means) at St John’s 5 Dec.1836, of Lincs., son of Rev. DWC (Daking William Carter) Moore; matriculated in the University Michaelmas Term 1837; gained B.A. 1841, M.A.1847. ordained deacon (Lincoln) Dec. 19 1841, priest 18 Dec. 1842; curate of Barton-on-Humber Lincs, 1841-3; curate of St. Anne’s Limehouse 1843-6; curate of West Ham Essex 1846-8; curate in charge of Flordon Norfolk,1848-52; ‘deprived of his licence by the Bishop of Norwich, for having, in full canonicals, cursed a magistrate of Norfolk as he was getting into his carriage at Flordon station’; committed to Norwich Castle 21 March 1852; domestic chaplain to Viscount Valencia, 1855-84; curate of Leyton Essex, 1867-9; curate of Woking, Surrey, 1869-71; curate of St. Martin’s Colchester and curate of St. Peter’s Colchester ,in 1878; chaplain of Colchester Union, 1875-84; author: ‘Sermons: The Institution of the Sabbath’, etc. ; died 1884. John Maber, the curate of Woking, his wife Theophila, daughter Ethel Mary, son Alfred, a nurse, Mary Ann Elson and a servant, Alice Emma Crane. Another curate of Woking, Francis Champneys, was living at Goldsworth Old Nursery with his mother Sophia and sister Jessie, a cook, Kate Lambert and a servant, Susan Gray. An entry in Edward Ryde’s diary of 7th May 1884 (now in the care of the Surrey History Centre) notes, Attend sale of the Glebe at the Masonic Hall and buy the little meadow for £120, (George) Smallpeice buys the House and Garden for £440, the house having no connection with the church thereafter. Drawing and Sitting Rooms, Study, Kitchen (fitted with Range, Cupboard and Dresser), Butler’s Pantry (with Sink and Water laid on), Larder, Cellar and a detached Scullery and WC. Four bedrooms, Dressing Room, Bath Room (with hot and cold water laid on) and WC. The grounds were described as well timbered and comprising Lawn, Flower and Kitchen Gardens. There was Stabling and a Coach House. For those wishing to view, the keys were with Mrs Cole, close by. Prior to the building of the Old Vicarage, the Parsonage was on the north side of the High Street either as the house now known as The Old Manor House or on that site. Parsonage and Ford Farms were farmed together and owned by Edward Ryde. The two farms were sold by auction on 2nd November 1892 following Ryde’s death. Parsonage Farm was between the Old Manor House and what is today Manor Way. Ford Farm was on the other side of Manor Way with its entrance opposite where the entry to the printing works installed in what was originally Woking Mill. There were two farmhouses or homesteads attached to Ford Farm, one a modern construction and a single homestead at Parsonage Farm.